Already one of the most popular pastimes in prisons and increasingly popular in schools and colleges, spades is long overdue for an appearance in pop culture alongside less fun games like poker hogging all the TV tropes card game spotlight. Whereas the 90’s saw countless sitcom characters playing solitaire, in the new century and the internet age, one can easily pass time with a card game playing with others online. Many prefer online play as well. 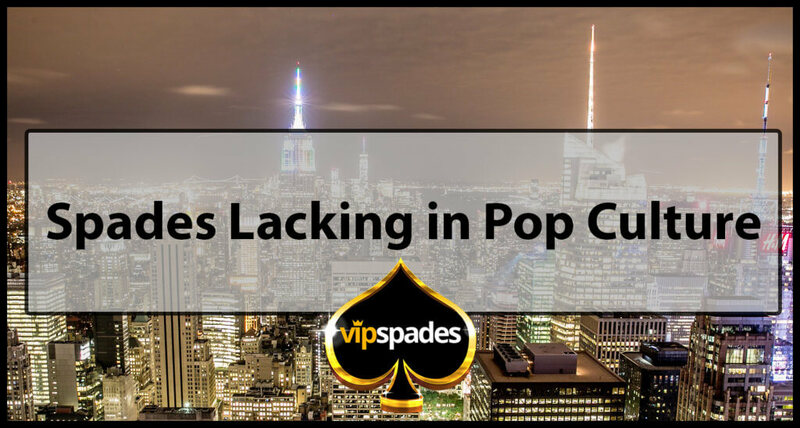 While gambling on spades is possible as well, the game also lacks media popularization because it is less of a canary in the coal mine to show that a character in TV or film has a serious gambling problem. That is pretty much always the providence of poker as well, with very little acknowledgement of spades! Rather, a game derived from the whist-family of card games (much like Bridge), spades is a much more wholesome, much less intense game (with variations that can make it much more challenging too) long overdue for some media love. The only spade that really matters though, is getting back to the best card game ever made, the game of spades. You can play it now if you’re interested, on browser or mobile. VIP Spades lets you play online for free. Let’s see David Spade give you the time of day. Spades is mainly a 4-player game where you’re all dealt 13 cards out of a 52 card deck. This allows you to play anywhere you want, with minimal setup. All you need is a few players and a deck of cards and you’re ready to begin playing! Many people think that it’s just another card game, but little do they know that the game has a lot of science involved if you want to come out on top at the end. Will spades make a comeback? One would assume that spades hit its peak in the 90’s and won’t make a return to the previous glory it held back then. The good news is that it’s slowly becoming more played via online websites like VIPSpades, which is slowly helping it make it’s comeback. We can’t assume that the game will be as famous as it once was, but for a spades enthusiast, this can be seen as great news coming forward. Spades is one of those games where you can’t really get sick of it. The reason that other games increased in popularity after the 90’s and spades became played less and less is due to the amount of new games being used to gamble. Gambling has been the heart of card games for years, and you can imagine that it will continue to influence pop culture by choosing what the popular game is at any given moment. If Spades can make its way back into more casinos and become more popular in gambling, then the game itself will become more popular and will be in front of the eyes of even more people. If you love playing Spades, teach your kids, teach your friends, teach your neighbors! It’s a great game to relax with due to its calm nature and you can expect to get closer with people by playing this game with them. Online play is much easier. The accessibility that you have when playing online is one of the main reasons why online gaming as a whole has become so popular. You can play whenever you want. Rather than repeatedly playing your uncle in Spades and beating him over and over, you can challenge yourself by playing someone new online. This is much more fun, and allows you to display your skill to thousands of people if you choose to. You can gamble online and make a ton of money if you’re good enough, and the opportunities with gambling online are far greater than placing $10 wagers with your brother every few weeks. Gambling makes card games a lot more fun, as we all know. With everything being online, online gambling and card-playing is going to increase. Our world is becoming so full of technology that, with playing games like Spades, we’re going to be able to play more games online like this. The setup when playing online is completely gone. You don’t need to shuffle cards, you don’t need to deal, you don’t need to worry about losing cards and only having 51 cards rather than all 52, and it’s completely impossible to cheat when playing online unless the person you’re playing is sitting right next to you in real life. Due to all of these reasons, you should be totally convinced to play Spades online the next time you’re looking for a quick game. Why is spades so popular in prison? As noted earlier, Spades is a very popular game for people to play in prison. But why is this? Spades is the perfect game for prison inmates to play because it requires 4 players (perfect amount for a prison game) and allows you to wager things and place tricks in the game. The wagers can include things such as commissary, items they have, and food. Spades is also a perfect game to play that involves you to talk loudly while playing, which prison inmates are known for. The largest difference between playing the game in prison versus playing the game outside of prison has to do with the rules involved. While in prison, it’s very common for new rules to be put into place to make the game more interesting, while outside of prison it’s most common to just play the game the correct way. The perfect way to implement Spades into modern day pop culture is to show a group of prisoners playing Spades together (could be done in a show like Orange is the New Black or Prison Break). So, if you have a deck of cards and don’t know how to play spades, get some friends together and learn! If you don’t own a deck of playing cards, what are you doing in life?